Regatta - Condo de luxe avec terrasse - Marche pour Vanderbilt Beach! Une des résidences les plus souhaitables du complexe de gated Regatta! Condo élégant et confortable - idéal pour se détendre avec la famille et les amis dans votre salon spacieux, assis dans votre véranda / véranda ou vous prélasser sur votre propre terrasse extérieure avec escalier privé menant à la piscine tropicale du complexe. Le complexe dispose d'un bain à remous, d'une salle de remise en forme, de barbecues au bord de la piscine et d'un second bassin. Une courte promenade de la célèbre plage Vanderbilt & Ritz Carlton. Nombreux magasins, restaurants et lieux de divertissement à proximité, notamment le haut de gamme Mercato. Cet endroit va inspirer de merveilleux souvenirs de vacances! Pour en savoir plus sur la piscine du complexe «Trèfle à 3 feuilles»: le 1er trèfle est une entrée à zéro; 2ème trèfle a un pas et est alors 3. 5 pieds de profondeur; le 3ème trèfle a une profondeur de 4,5 pieds; De plus, il y a une cascade en cascade que vous pouvez marcher et vous asseoir derrière. Fabuleux pour les enfants - Fun Fun Fun !! We have stayed at the Regatta just about every year since 1999. We love the pool area and the short 5 minute walk to the beach. It's gated and they do a good job keeping the place clean and well maintained. There are plenty of restaurants within walking distance as well as the Ritz-Carlton with it's many dining outlets right across the street. It's a perfect place for Spring Break, away from noisy teens and college kids. The Cassidy Condo is one of the best we have ever stayed in. The home is well appointed with an elegant touch. Good entertainment (TV and WiFi) options and ample seating. In addition to the screened-in Lanai, we appreciated the 2nd floor sun deck with gated access to the pool via steps. We could sit out in the sun without having to fight for a spot at the pool. We ended up using that entrance more than the front door. The condo had EVERYTHING! It had a standard coffee maker and a Keurig, every tool you would need in the kitchen, plenty of pots, pans, plates, glasses (for every type of drink) and a fridge with Ice Maker. In addition, there were multiple cooler options, plenty of beach towels, Tommy Bahama Beach Chairs and even a beach caddy with wheels to take all your gear and cooler to the beach. You only need to bring your sunscreen. We are already planning our trip back next year. Thanks for a great stay Sandra! Great location, private patio in the sun. We have stayed in this well-equipped condo for the last four years and loved it! It is a second-floor unit which means there is a large private patio which is in the sun for a good chunk of the day. The unit/patio faces West and has a private staircase which leads right to the pool. (No need to lay in the sun by the pool.) My wife and I enjoyed fishing on several piers on the property. The location is great. A short walk to the beach or to the Turtle Club or Buzz's Lighthouse. We also walk to several restaurants, two movie theaters, the Mercato and Publix. No real reason to get in your car. 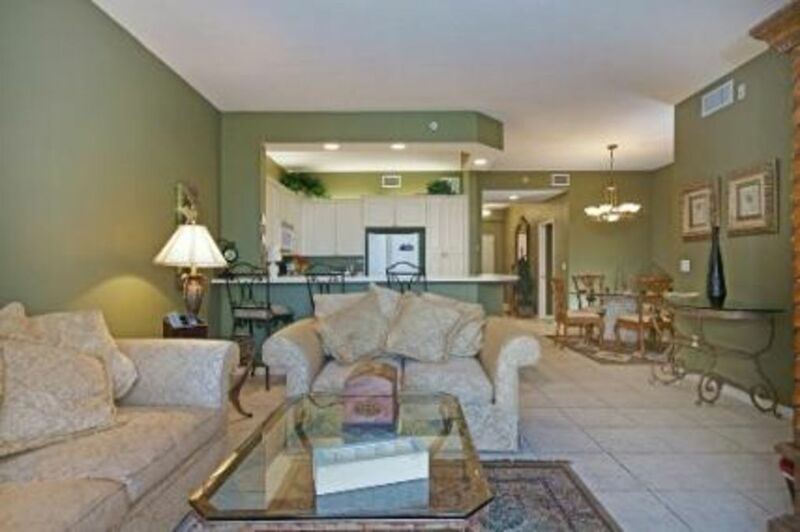 The condo itself has a great layout. It could use some updating but is very nice and well worth the price. The owners are great to work with. We highly recommend staying here! We love having you as our guest! Thank you for the great review. Improvements are a continuous process and we work hard to make the condo a welcoming and comfortable place to stay. We loved the location and the property had all the amenities that we were looking for. The Cassidy's were very responsive and went the extra mile. We hope to stay again soon. We are very happy that you enjoyed your visit! We spent last week at the Cassidy’s condo and were very happy with our stay. As indicated by most of the other reviews, this condo has a huge advantage to most others in the complex with the large deck and walk-down to the pool. So much better than taking the elevator down from the higher up units. Was great for the kids, and for the parents! The condo itself was exactly as represented in the pictures and was spotlessly clean upon arrival, comfortable and well-appointed. We cooked a few times and the kitchen had everything we needed and all in good working order. It was an easy walk to the Ritz (end of day cocktails) and Vanderbilt beach (a bit crowded, but it was spring break, so a busy week). Close to many restaurants, shopping and good biking trails. The condo had plenty of space for the 4 of us, and could accommodate up to 6. Sandy was very responsive, helpful with suggestions and a pleasure to work with – we could not ask for more in that respect. We really enjoyed our stay and look forward to our next visit. Rates are subject to change until reservation is confirmed. 10am Check Out / 3pm Check In No pets. Non-smoking only.